The red-hot Huskies (12-4, 3-0) take their 5-game winning streak and perfect 8-0 home record into Thursday's matchup against Stanford (8-8, 1-3), which has beaten UW in the past three games. Records: UW (12-4, 3-0): Stanford (8-8, 1-3). 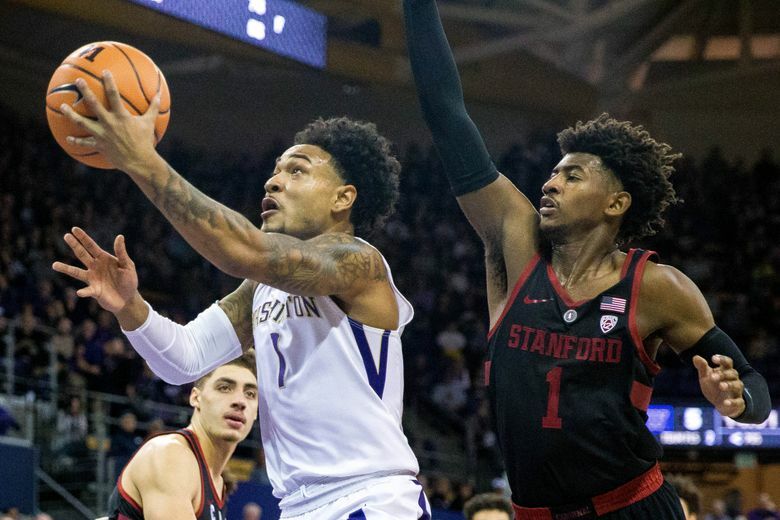 Scouting report: Washington is riding a five-game winning streak following last week’s victories at Utah (69-53) and Colorado (77-70), which was UW’s first Pac-12 road sweep in six years. … The Huskies are 8-0 at Alaska Airlines this season. … Washington is 3-0 in the conference for the first time since 2015-16. The Huskies last started 4-0 in 2012-13 and 5-0 in 1983-84. … UW has had six different players lead the team in scoring, including Jaylen Nowell (7), Noah Dickerson (5), Naz Carter (2), Matisse Thybulle (2), David Crisp (1) and Dominic Green (1). … The Huskies rank first in the Pac-12 allowing just 63.0 points to conference opponents. Stanford is ninth in the league surrendering 78.8. … The Cardinal might have saved its season with an 85-71 win over Arizona State last Saturday that snapped a 3-game losing streak. Before the win, Stanford has lost 4 of its previous five games. … The Cardinal was projected to be a Pac-12 title contender before three-year starter Reid Travis, a preseason league MVP candidate, transferred to Kentucky. … In Pac-12 games, Stanford F KZ Okpala ranks second in scoring (21.0 ppg.). For the season, he’s shooting 47.9 percent on three-pointers. He is 8-of-16 from three-point range in four Pac-12 games. … Eleven of Stanford’s 15 players are in their first or second year playing. Only senior Josh Sharma and juniors Marcus Sheffield, Trevor Stanback and Rodney Herenton have more than two years of playing experience. Through 16 games, first and second-year players have accounted for 83% of Stanford’s scoring (972 of 1,170) and 81% of Stanford’s rebounding (460 of 571). Key matchup: The Huskies will need to corral and contain Daejon Davis, a former UW Husky commit and Garfield High star. Last January, Davis returned home with his new team and tallied 16 points, 10 rebounds and five assists to lead Stanford to a 73-64 win at Washington last January. If not for seven turnovers, it would have been perfect performance for Davis. The sophomore standout had a relatively slow start this season, but he’s been surging since December. In the past eight games, Davis is averaging 16.3 points, 5.9 assists, 3.4 rebounds and 1.6 steals. … On the defensive end, Davis will likely pair up against his former high school teammate Nowell. Coach: Jerod Haase is 41-41 in his third year with the Cardinal. He has an 18-22 record in Pac-12 games. Haase posted an 80-53 record during a four-year stint (2012-16) at UAB. His overall coaching record is 121-94. … As a player, Haase started 23 games in 1992-93 as a freshman at California, teaming with Jason Kidd in the backcourt. Haase transferred to Kansas where he started 99 of 101 games in three years. The Jayhawks posted an 89-13 record with Haase, who averaged 12.5 points. The series: Washington trails 77-71 in a series that began in 1916. … Stanford swept UW in a pair of games last season and the Cardinal is 7-3 in the past 10 meetings. Last meeting: Travis ran roughshod over the Huskies while scoring a career-high 33 points and led Stanford to a 94-78 win at Maples Pavilion on Feb. 22, 2018. … The Huskies trailed 48-26 at halftime and never mounted much of a challenge in the second half. … Nowell led UW with 18 points, 8 rebounds and 5 assists. Dickerson finished with 14 points and 13 rebounds.